This Easter dinner table comes with a handmade, unorthodox centerpiece and a cool contemporary look. The little kraft paper nests take the sleek edge off this Easter table setting by adding 'natural' color and unruly, accidental shapes. 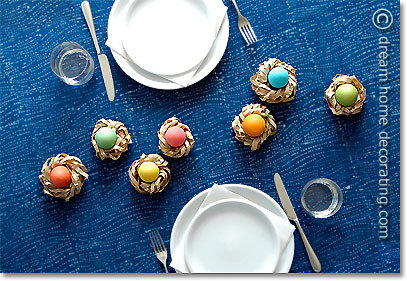 They are extremely easy and quick to create - learn how to make paper Easter nests here! Instead of using small, single-egg nests you could go for larger nests with more eggs in them - or create a combination of smaller and larger ones. 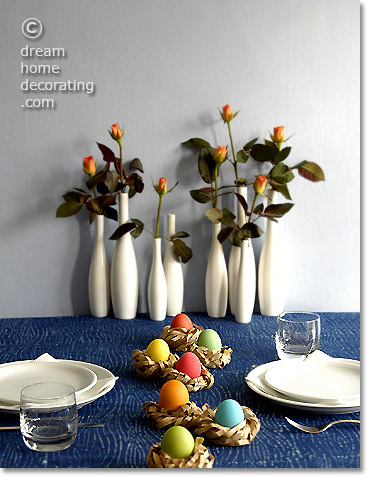 On a plain or color-blocked tablecloth, patterned eggs would look fantastic, too! Instead of this casually meandering arrangement, you could bunch a few nests together or arrange them in a straight line. Light neutral brown, deep indigo and white make wonderfully serene color combinations, and colorful Easter eggs will 'pop' beautifully against this background. Return from Easter Dinner Table to Easter Craft Ideas.